Downtown:KING size bed! Huge hot tub. Close to town Elec.car charger! 2 Bedroom 1 king, 1 queen, all new appliances. Completely remodeled. PRIVATE!!! 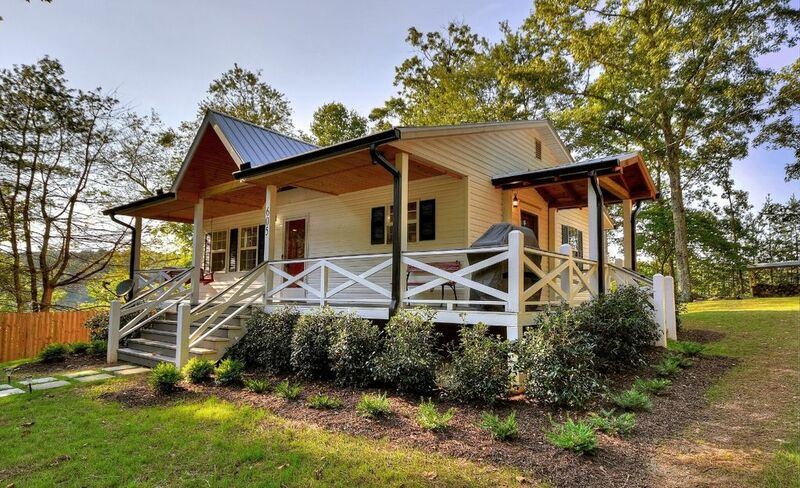 The large front porch and classic porch swing are the first welcome to Blue Ridge Farmhouse and it just gets better from there. Hardwood covers the main floor space with a warm area rug in the living room. You can turn on the gas fireplace and cozy up with a throw blanket or enjoy the reclining leather sofa with some television. The kitchen just begs for you to prepare a meal! Completely stocked with Pioneer Woman pots, mixing bowls and casserole dishes giving it the authentic farmhouse feel while also boasting granite counter tops and brand new appliances – even a dishwasher! The kitchen also includes place settings and a farm house table for four. The master bedroom is tastefully decorated to ensure a relaxing environment. The luxurious king size bed, plump pillows and flat screen tv only add to the rustic charm. The Jack and Jill style bathroom has the perfect clawfoot soaking tub, handheld sprayer and plenty of towels. The farmhouse is delightful for a romantic weekend away, but sometimes you may want to bring your friends or family to fully enjoy the area. The second bedroom has a queen size bed and a dresser with a large mirror. The dusty blues and succulents create a peaceful feel. You’ll enjoy evenings outside either in the extravagant hot tub or gathered around the firepit for some s’mores. String lights set the mood on our covered deck and there’s a barrel table close by for drinks afterward. The sound of crickets will remind you to enjoy your country nights and birds singing will brighten your mornings. Our spa room has a sauna and large shower with body jets. There’s plenty of room to set up a massage from a local spa, and a heating air unit that houses a smart tv. The lower level also has a checkers game table and laundry facilities. A gas grill right outside the kitchen entrance from the porch. Coffee station - Keurig, single brew coffees/teas, creamer and sugar. WIFI and Dish Television to keep you connected. Plenty of accessible outlets in the living room and bedrooms for charging devices. Charging Station for all makes of electric cars. COMING SOON!!! Brand new Honeymoon Suite Next door at THE BARN. Matthew Carroll is born and raised right here in Blue Ridge, GA. He met his wife, Carrie, at the local high school and they have been building a family together since 1995. The Carroll’s have also been local business owners since 2004. Matthew truly is a Blue Ridge connoisseur with tips on what restaurants to try, different attractions to see, and some local gems. He’ll give great directions to get you wherever you want to go. Blue Ridge Farmhouse was recently remodeled. Matthew & Carrie has put a lot of care into making it a wonderful place to stay. Please don’t hesitate to give your input! He is always open to suggestions to improve the house for your next visit or other guests. Ask any questions you may have about the property or the Blue Ridge area. We love Blue Ridge and this little house seemed like the perfect place to make a cozy little getaway for people who want to have a nice quiet place to relax but also be just a hop, skip, and jump from all the action of downtown. This a a perfect place to stay if you want to be close to town, but feel like you are far away. We frequent Blue Ridge, so being close to Main St is important, but also our favorite fishing spots. The bed was incredibly comfortable, and the downstairs amenities (including sauna, massage chair, and hot tub) were perfect after a long day. Had a chance to meet the owner when he stopped by to fix a minor problem with the hot tub, and it was great to hear all of the history behind his family and Blue Ridge. You will not be disappointed with this updated home away from home! We went with our two boys and the house was perfect. Super clean and spacious with plenty to do. The kitchen is perfect for cooking and has everything needed. We enjoyed the hot tub and playing outside and even the fire pit. Great location for venturing out. Great decision for our spring break! Thank You.Please come back soon. Was a nice little cabin but felt like it was huge with all the amenities. Everything was set up before arrival and I could not of asked for a better place. The place is not too far from downtown but far enough away. If I ever come to Blue Ridge will look for this place again. Thank You, please do come back. we will have a special available for repeat customers. Wonderful newly renovated cabin! A few small annoyances (couldn't open oven without opening dishwasher), but the rest of the experience was very nice. Highlights included the hot tub and sauna. Very clean, too! Thank you For your review. Yes We made a slight mishap with the kitchen layout so its a little tight in that corner.The oven will open with the dishwasher closed but have to make sure the oven is pushed tight against the wall. Sorry for the inconvenience but we're glad you enjoyed. Chip and Joanna Move Over! WOW! If you're looking for a cozy, ADORABLE, clean, convenient and fun place to stay very close to downtown Blue Ridge...THIS. IS. IT.! What a great weekend we had in this beautifully decorated little house with EVERYTHING you could possibly want! The pictures don't do it justice! So comfortable, trendy and loaded with things to do while you're on the property. Corn Hole, HUGE covered hot tub, fire pit, porch swing, indoor sauna, massage chair (with TV to watch), checkers table, amazing bathtub, king sized bed in master, leather recliner sofas and a beautiful kitchen! I believe it is under 2 miles into downtown and we enjoyed (splurged) on two fantastic dinners at Treo and then Black Sheep. We also had a spa day at Serenity in the Mountains which we highly recommend! So relaxing, great service and the kindest people anywhere! Matthew, the home owner, was so easy to work with and responded to all our questions/requests! We highly recommend!